Our staff is very knowledgeable and will be willing to help with anything you may need! 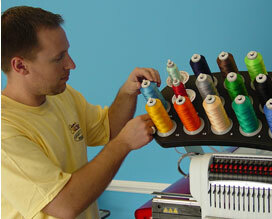 With brand new Melco embroidery equipment, the list of embroidered items that we can offer is unlimited. Being a family owned business, we will do anything we can to help your company or group look sharper, more professional, and give you that invaluable exposure that is essential to success! Our office is located right in the heart of downtown Clarksville. Our Vice-President, Robert Brogden, will be more than glad to meet with you and discuss the different options that are right for your organization.